Anyone who’s ever tried to take pictures of a touchdown about to be scored or a snake poised to strike knows that in photography, timing makes much more of a difference than the camera or lens one is using. In our eagerness to get that well-timed shot off however, many of us are tempted to rely on nothing but our quick feet and questionable grip of the camera to get into position. More often than not the result tends to be a blurry mess and a wasted opportunity. Taking your trusty tripod along would be ridiculous in such cases – not only are they as heavy as a bag of bricks, but they take ages to set up. By the time yours is up and running the action may be long gone. Monopods are a better option, and certainly a more viable one than propping your camera up with an umbrella! In this guide, we look at the best monopods available. Heavy-duty construction and good grip and strap. Stable on all surfaces and built-in compass. 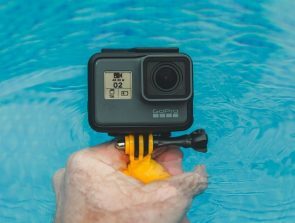 Great for both video and photography. Excellent stability. Monopods combine shot stabilization with a light build. When using one, you can take your photo and zoom away to get a better angle from a different location in the time it takes to set a tripod up! Sure, when patient shooting under demanding light is called for tripods still reign supreme, but they’ve got nothing on monopods when you’re faced with the possibility of getting a split-second chance at a once-in-a-lifetime scene. They are built from different materials, feature different heights as well as carrying capacities, and range in price from steep yet impressive to cheap but uncompromising. 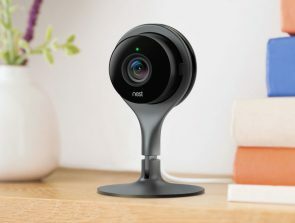 Beginners and photographers with decades of experience will both find worthy additions to their gear, and maybe pick up a helpful hint or two from the insightful buyer’s guide that follows our reviews. When nothing matters more than capturing a picture-perfect moment in time, you only want the best monopod available to help make the shot as clear as possible. When a monopod goes above and beyond what you’d expect from such a seemingly simple tool, you know that even a heftier price tag is nothing in comparison to a new layer of quality your art is getting imbued with. You might be thinking that we’re overselling Sirui’s SUP204SR – if anything, we probably aren’t even getting this monopod all the credit it deserves. At 3 pounds the SUP204SR is a behemoth among monopods, but there is a valid reason for this added weight – three extra support legs. Don’t mistake this as being a compromise as the SUP204SR is still very much a monopod. A monopod however with additional possibilities, like the ability to seamlessly pan your camera a full 360 degrees without messing up its height, or locking it in place and tilting an additional20 degrees to frame the shot exactly as you imagined. All the while the SUP204SR remains rock solid, even more so if you step onto its feet. These can also be completely removed, leaving you with a true monopod that’s lighter, yet only marginally less stable thanks to its rubberized lowest section and the spike you can replace it with. Close to that is a tension screw which attaches the lowest part of the monopod to the rest. Unscrew that lightly, and voila, you get a swiveling action too. Weight is the major issue some people might have with the SUP204SR. 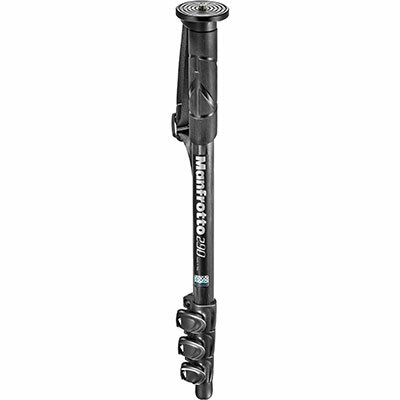 At three times as heavy as others in the list, it’s a monopod you’ll want to use when changing positions entirely isn’t something you need to do all day as carrying it along with other heavy pieces of photo equipment can get tiring. Other than that, the twisting action of its segments could have been smoother as some of them can jam up, requiring you to apply a bit of force in order to unscrew them. Height when collapsed: 27 in. Sirui is one of the most recognized and well-respected manufacturers of high-end photography accessories. While some of their products come in at prizes that would make your head spin, here we have an affordable yet versatile monopod you won’t hesitate to take along every time you shoot in the out of doors. Just make sure to check if you’re still carrying it when getting off a bus or train as the P-326’s weight and small form factor can easily make you forget you had it with you in the first place! This monopod is indeed the traveling photographer’s best friend – At 0.9 pounds, it’s one of the lighter ones we’ve had the chance to work with. More importantly, it is only 15 inches long when collapsed, so storage should never be a problem. Attach it to your camera bag or backpack via the handy carabiner clip and you’ll forget about it until it’s time to shoot. If you happen to get lost in the woods, there’s even a small compass you can look to for guidance. A bit redundant in the era of GPS phones, but hey, we aren’t complaining! Once it’s time to set a camera up, one finds that both of the P-326’s ends are pleasant to work with. The top boasts a comfortably wide base and supports 1/4″-20 as well as3/8″-16screws, accommodating practically every camera and piece of related equipment you wish to mount as long as it is lighter than 22 pounds. 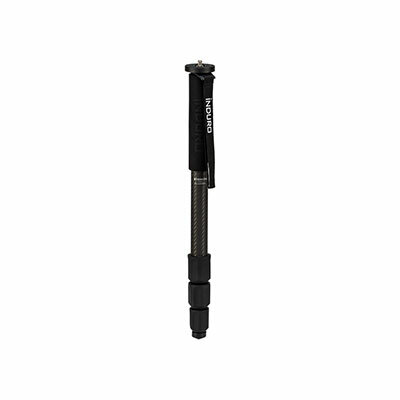 The tip has a nice rubber coating that will keep it from budging on most normal surfaces, and a spike you can extend if ever you need to shoot in muddy or icy conditions. Are there Flaws to Consider? There’s always something no matter how great the product, isn’t there? Fortunately for the P-326, that something happens to be situational and not that serious. Rather than relying on a quick release lock, you have to unscrew and extend each of the sections manually when setting up and vice versa when packing the monopod back up. This won’t be a problem if you mostly take shots from one place, but if you’re covering a baseball game for example and need extra time to set up between shots, you might not catch the crucial play in time. Height when collapsed: 15 in. The CTM-2400 is a textbook example of well-roundedness. 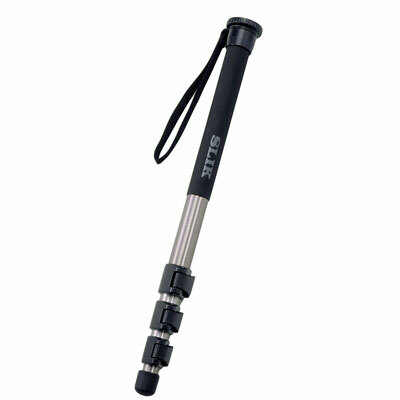 For a moderate price, you’re getting a light monopod which can bear more than 20 times its own weight, doesn’t occupy much space once folded up, and has everything in place for easy attachment of your treasured camera. Taking a well-timed, stable shot is something you’ll quickly become accustomed to as you keep using this monopod. As its carbon fiber construction makes the CTM-2400 weigh just south of a pound, quickly switching angles and zoning in on subjects isn’t a problem. There’s a spike on its base you can extend if need be, giving you even more stability. For a maximum height of about 60 inches, four sections seem to be a good solution – one never feels like the monopod’s rigidity is compromised, even at its maximum height. While the CTM-2400 performs well once extended, getting it there can pose a problem depending on the particular unit. Sometimes the manufacturing process bends the sections ever so slightly, making them harder to extend. There is a rubberized grip, but that too could have been a bit more comfortable. Height when collapsed: 18.3 in. 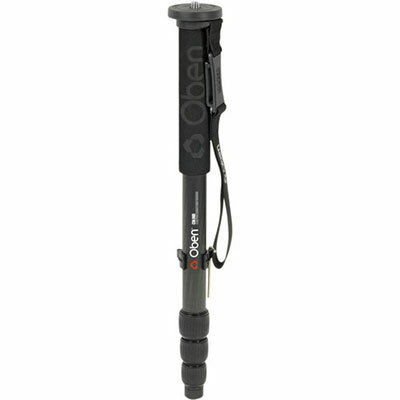 Need a rugged monopod which won’t only budge, but will withstand the elements with no ware? Look no further than Induro’s CLM304L No. 3 Stealth then as it has what you need to pull off those challenging shoots which leave you with fantastic picks and the strong need to wash all the grime off of yourself when it’s finally over. You might be the worse for wear afterward, but the CLM304L No. 3 Stealth certainly won’t! For what’s essentially a copper fiber stick with a modest weight of 1.2 pounds, the CLM304L No. 3 Stealth can sure hold its own. Able to support up to 40 pounds of weight, it allows you to put some of your own into stabilizing the shot as well, bracing with your legs to make a tripod stance. Individual tubes are set firmly in place via sturdy clamp locks which don’t give, even under pressure. Plus, the clamps are especially treated to withstand dust and moisture buildup, so you don’t have to be afraid of trying the monopod out in difficult weather conditions. For the next entry in the Stealth series, Induro might want to concentrate on addressing some flaws with its monopod’s rubberized foot. It’s the first thing that’s likely to buckle as the material used to make it isn’t the finest. Similarly, the strap shouldn’t be tugged on too violently as it is prone to snapping. Height when collapsed: 20.7 in. What would a photo accessory showcase be without at least one product by renowned Italian manufacturer Manfrotto? We’ve opted for their carbon fiber representative in the well-received 290 series as the improvements it has over its aluminum cousin are nothing to sneeze at. It’s a quality monopod built to last and support a wide array of cameras on the fly while being as easy to use as can be. The coolest thing about this addition to the 290 family is its handy dual mounting system. Basically, this gives you a standard 1/4″-20 mount which is also ingeniously enveloped in a 3/8″-16 sleeve. 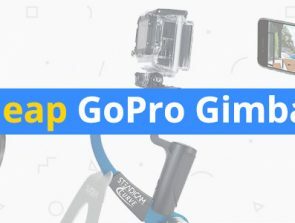 This lets you attach a camera to the monopod directly, but you can choose to attach something like a telephoto lens instead and then screw your camera onto that. Since there’s no need to turn anything over, switching stabilization from one piece of gear over to another is done quickly. Speaking of quickness, the MM290C4US 290 boasts a rapid setup. Release each of its clamps, extend the segments, and you’re in business. This carbon fiber version is a little lighter than the aluminum one, which also lacks the innovative mounting slots. With a respectable carrying weight of 11 pounds and a top height of almost 5 feet, expect it to offer stability for most of your gear without having to stoop. With manufacturers like Manfrotto, one expects quality craftsmanship and the MM290C4US 290 delivers. Probably the only thing we could fault it with is its collapsed length. 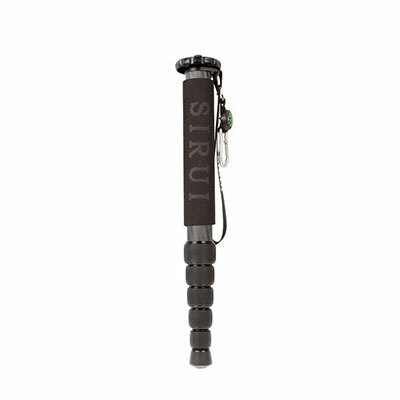 At 22 inches it is longer than every other monopod we’ve reviewed except the Sirui’s SUP204SR, so you won’t be able to stow it away in a smaller carrying case if it starts pouring. Height when collapsed: 22 in. If you’re a beginner photographer or you are just now starting to discover the joy of sports & scenic photography, chances are you don’t have heavy-duty flashes, enormous zoom lenses, and other weighty equipment to carry. Modest needs call for modest equipment, and Slik’s model presents itself as the perfect inexpensive buy for your first monopod. An unusual tidbit about Silk’s monopod is its material composition. Unlike its carbon fiber and aluminum cousins, it is made from an alloy of aluminum, magnesium, and titanium. The result is a material which does make the monopod a little bit heavier than most, but that greatly increases its durability. Expect this monopod to be able to handle a beating. Even though it is less expensive than other monopods in the guide, Slik’s model isn’t really that much lower in overall quality – it takes a tight hold of your camera and doesn’t let go. When extended, it doesn’t wiggle or slide. It has a solid grip, a nice strap, and a metal ring that makes it easy to attach it to a backpack via a carabiner. Slik’s monopod does have a few issues though. For instance, you don’t get a rubberized foot or spike and have to buy the foot separately. Second, the extension isn’t buttery smooth, at least when it comes to the first segment which has a tendency to catch. Finally, only 1/4″ screws are supported, forcing you to get a converter for video heads with 3/8” ones that may make any price advantage it has over the competition much smaller. Height when collapsed: 21.1 in. What to Look for in a Monopod? With the widespread use of carbon fiber, monopods have greatly benefited in terms of weight reduction. Although they’re more expensive on average, carbon fiber monopods can support items 10 – 20 times heavier than themselves with ease. 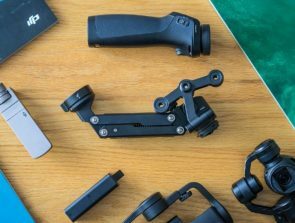 As the carbon fibers are taut and won’t bend if pressure is applied to them, your monopod will remain completely rigid even if you put a little bit of your own weight onto it for added stability. Aluminum alloys shouldn’t be discounted just yet though – the lower production cost makes monopods built with them more accessible. They’re also better at handling unexpected falls and other accidents. Generally speaking, aluminum monopods do better in gritty environments where bumps and scratches aren’t uncommon. Getting one on aluminum won’t be a big deal whereas nicking a carbon fiber alternative can have a negative impact on its structure. The monopods we featured extend between 59 and 63 inches, yet have between 4 and 6 segments regardless of their height. More segments give you greater control of the monopod’s height. This is particularly useful if you’re doing shots of kids or photographing bugs as it makes it easier to get the camera level with your subjects. More segments are also a hassle to set up though, especially the kind you need to unscrew. Releasing said segments as quickly and smoothly as possible helps decrease prep time. Clamps you release coupled with auto-locking are the most streamlined option. There’s also a screw-based system which is more hands-on and takes longer to use. The lack of additional goodies may not be a deal-breaker, but it can impact your monopod-using experience. One you should definitely look out for is a ball head. Ball heads let you tilt the camera they’re connected to. By keeping the monopod in place and only tilting the ball head, you’re ensuring smooth shots and aren’t endangering your monopod’s stability by tilting the whole device. 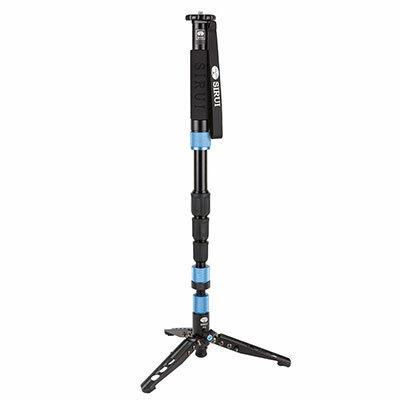 Extra feet come in handy as well – the rubberized foot / steel tip alone won’t prevent you from accidentally rotating the monopod. The addition of more feet won’t have a huge impact on its overall weight and will ensure that nothing will make the monopod budge.